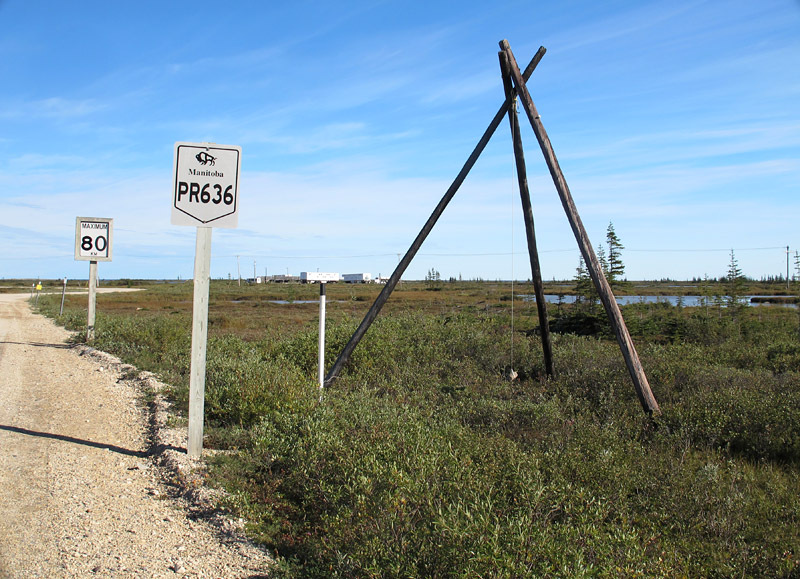 A cobble hanging from a tripod forms a humorous ad hoc “wind gauge” near the Churchill Northern Studies Centre. Down the road there is always something new to see. Even on a road you have travelled before, there will be unseen treasures, just waiting by the roadside to be discovered. 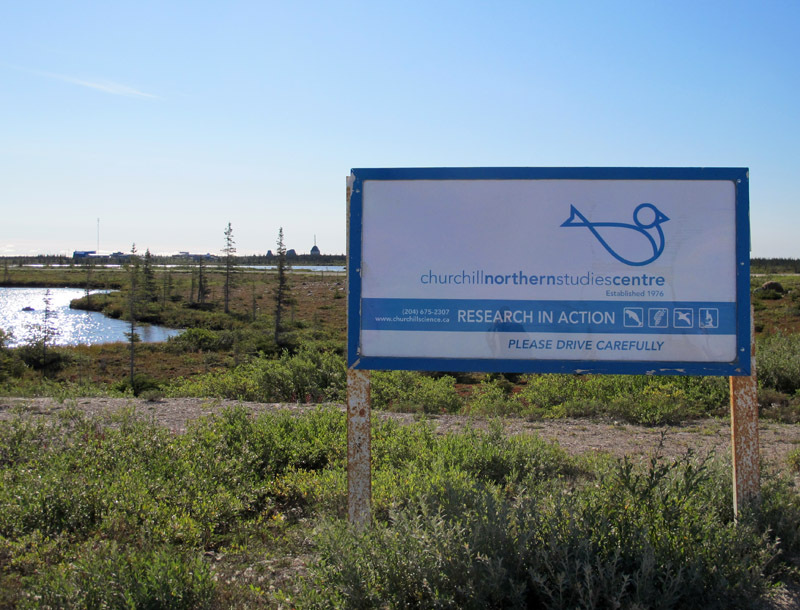 At the Churchill Northern Studies Centre (CNSC), our 2015 field season was complete. It had been a fantastic two weeks, possibly the best ever, but now it was done. The samples had all been wrapped, bagged, boxed, and palletized. Together with the field gear they awaited shipping in the dark of the former CNSC building. Our clothes, boots, and rain gear had been stuffed into packs and duffles, we had cleared out “our” vehicle, and we had tidied all of the lab spaces we had temporarily occupied. 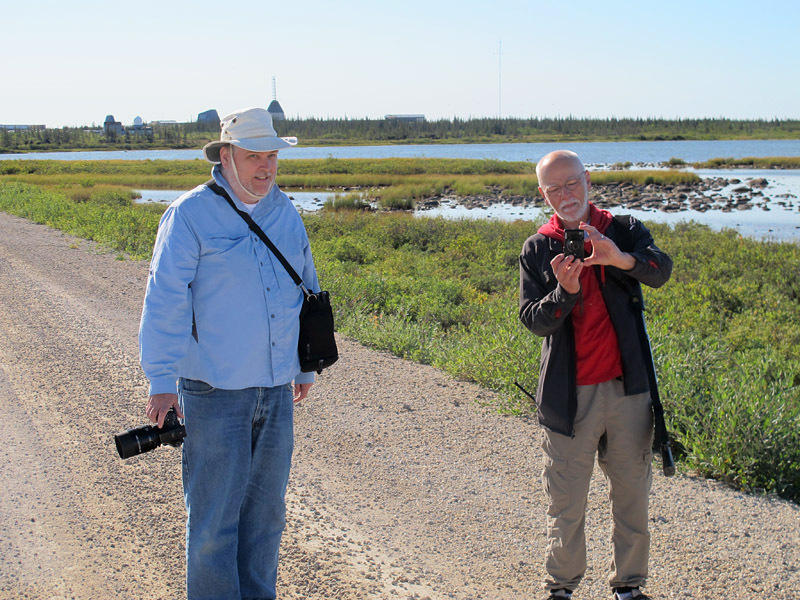 Michael Cuggy (L) and Dave Rudkin on the road, with the Churchill Northern Studies Centre on the horizon behind them. We really had nothing left to do on this clear morning, which felt warm yet carried within the first hints of an early-arriving northern autumn. Nothing to do but put on our walking shoes, gather up cameras, sign out a shotgun, and take a wander down the launch road. 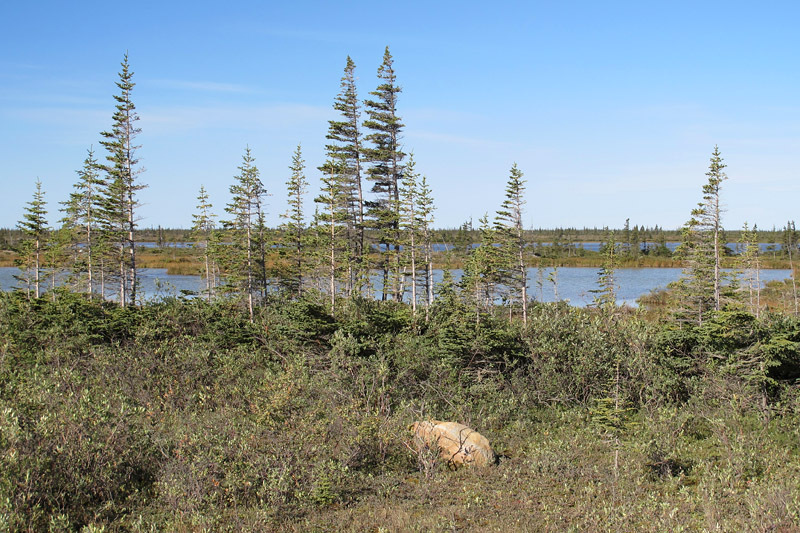 Plenty of time to contemplate this beautiful land, to examine in detail a stretch of gravel that we normally passed at what passes for highway speed around Churchill. And, of course, plenty of time to feed a bit more blood to those Churchill mosquitoes. 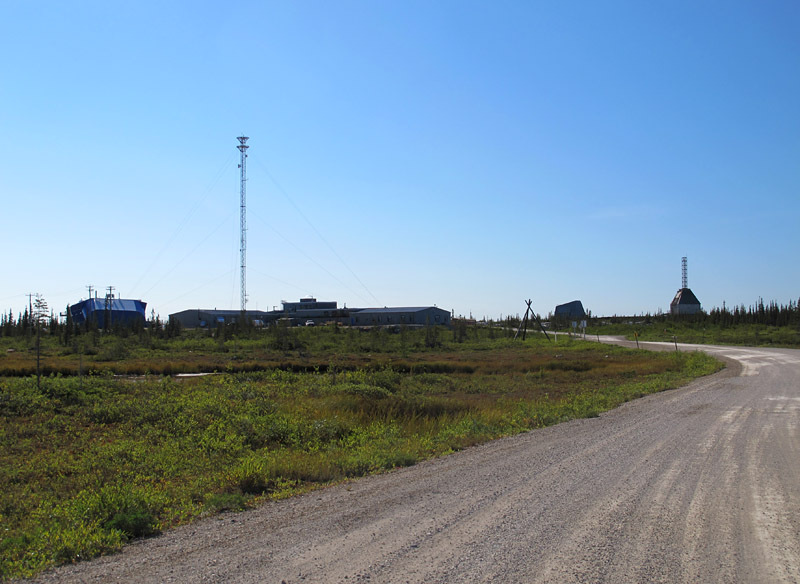 CNSC is to the left of the old research rocket range. The shrubs are already wearing the brown foliage of early autumn. 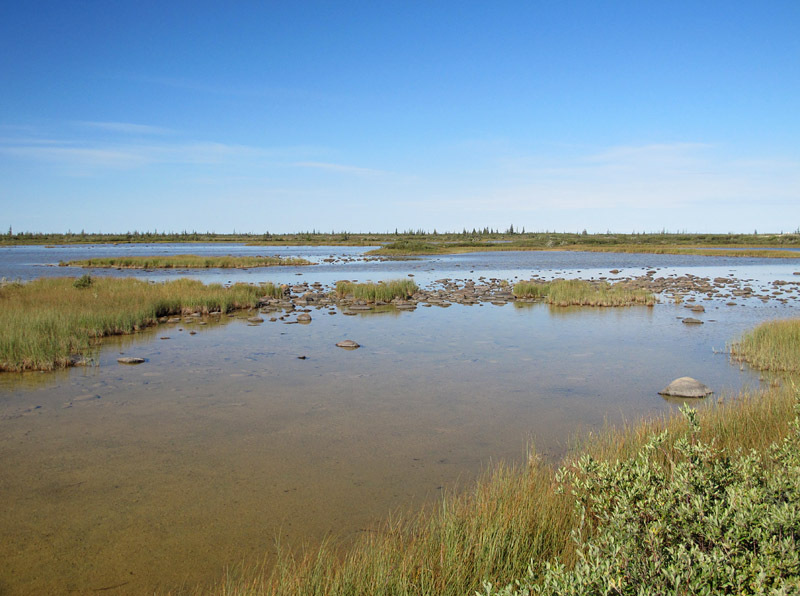 Between CNSC and the sea, the landscape must be close to 50% water. Let’s take a look at the bottom of this little pond . . . 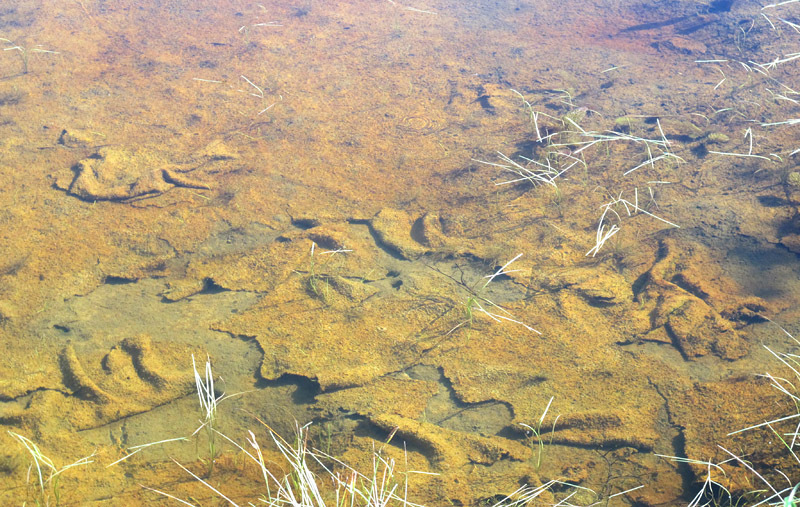 The pond bottom is cloaked with a microbial mat, which is wrinkled and ripped as a result of the wind’s movement of the water. 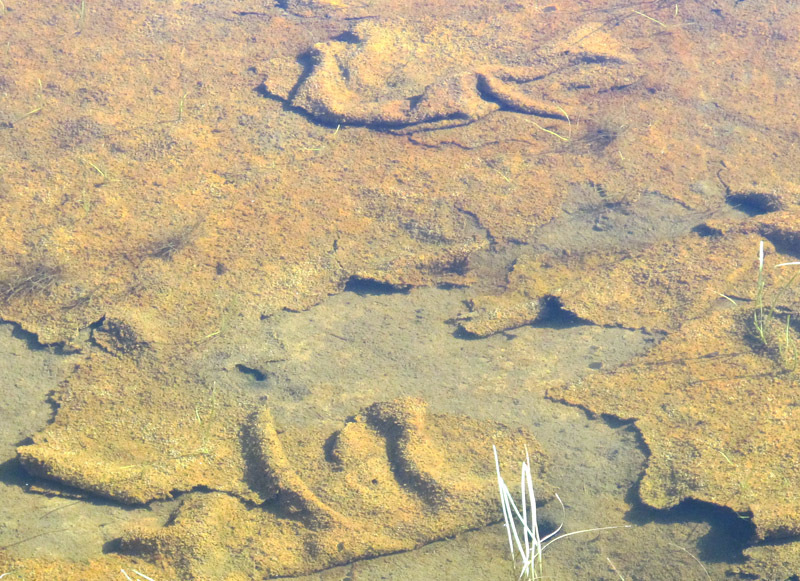 The mat is remarkably similar to structures we have seen in the Ordovician rocks at William Lake. And we have never observed these mats at Churchill in all our previous visits! Something else to explore the next time we are here . . .
A rocket on a stand marks the site of the old gate to the rocket range. Is that a bird? Is it a fish? No, it is the birdfish, the symbol of CNSC. Hi Graham, The tall microwave tower visible in a couple of the photos was placed there in 1966. It allowed us to watch television for the first time, but with a rather snowy picture for the most part. The Black Brant III rocket on the stand belongs in a museum somewhere. 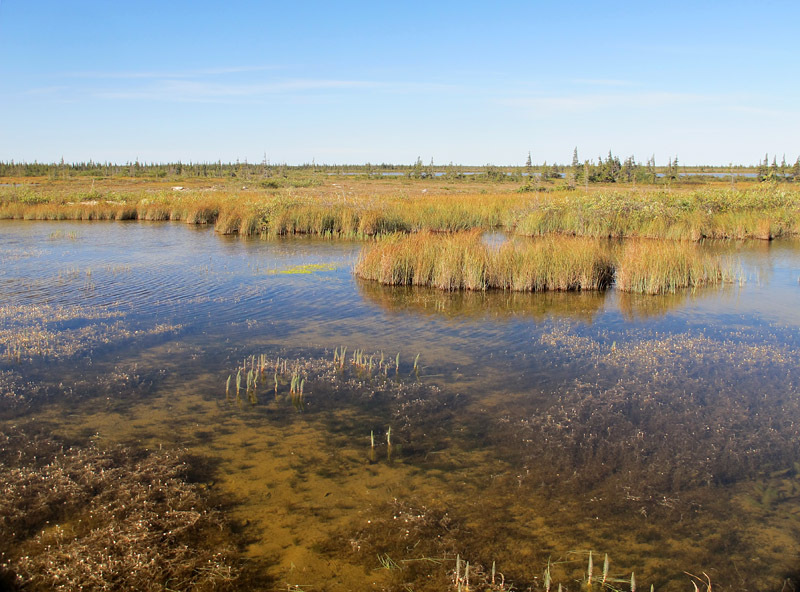 The “carpeted bottom of that pond, is consistent with most of the bottoms of the little lakes in the area. 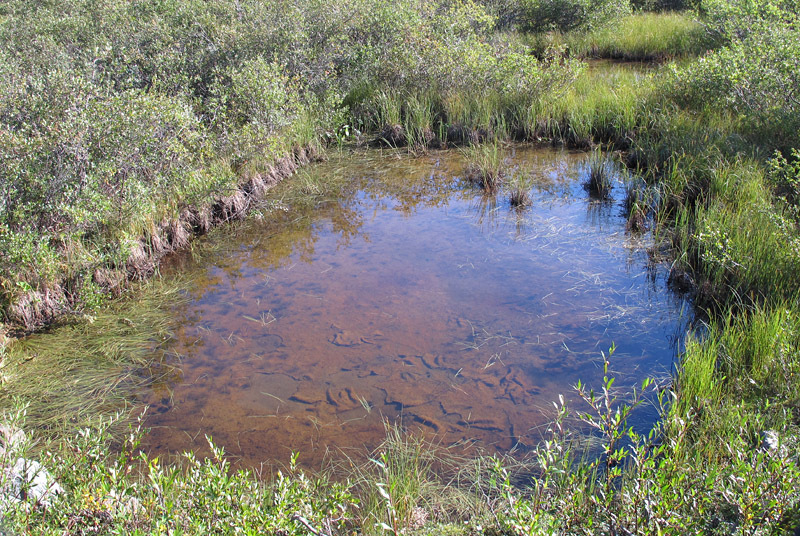 We felt the “squishyness” of that microbial matting, on the rare occasions that we swam in some of the larger ponds or lakes. Hudson Bay is permanently cold so it seems. Even on a warm day in June when the sand beside the Bay is hot to the touch of the foot, the Bay water is still icy and unswimable! Come to think of it, Lake Superior has a similar effect with hot beach sand… and frigid water, even in mid-summer. Many thanks again for the great pics!